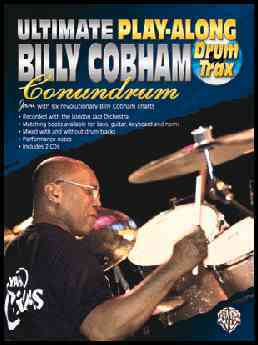 Tiger Bill Reviews Ultimate Play-Along Drum Trax: Billy Cobham Conundrum from Alfred Publishing. From the start of his career with Horace Silver through his days with John McLaughlin's Mahavishnu Orchestra and into his own solo recordings, Billy Cobham has been one of the most influential jazz fusion drummers ever to hit the scene. And he continues to influence a new generation of drummers with the release of his book and dual audio CD Ultimate Play-Along Conundrum. The book features six charts, which include tunes from Billy's first solo album Spectrum, while the accompanying audio CDs contain mixes both with and without drums to make it easy to learn from the master and to play-along with the charts using your own ideas. All the songs have been re-recorded with the London Jazz Orchestra specifically for this package. Each chart in the book is preceded by a section of Performance Notes, written by Billy himself, that discuss both the musical aspects of the song and offer tips specifically for drummers. On one hand, if you're looking for full transcriptions of Billy's drum parts, you may be disappointed. The book contains only "skeleton" charts that basically contain the major cuts (accents) that the drummer needs to make with the other band members. On the other hand, this makes the charts much more realistic (from a practical standpoint) and much closer to what you will actually find in the "real world." I, for one, don't like note-for-note transcriptions myself. I believe it's fine to want to "emulate" your favorite drummer or drummers, but copying their licks down to the last note is going a bit overboard. Plus, it doesn't really do much to help you develop your own creativity. So, for me, the "real life" charts in this collection are most welcome. In addition to the "Drum" version, matching books are also available for bass, guitar, keyboard, and horns. A nice touch. The book contains a biography and selected discography of Billy's work and includes six tunes: Torpedo Flow, Stratus, Red Baron, On the Move, Conundrum, and Eleuthera. Reading and interpreting charts are one of the most valuable skills any drummer can develop and this book can go a long way toward sharpening your skills for the real world. Although not for the beginning music reader, if you want to improve your chart reading and interpretation skills while picking up some valuable tips from Billy Cobham in the process, I highly recommend this package. And at a retail price of $19.95 for the book and two included audio CDs, it's a great value as well.